BISMARCK, N.D. – A manager for the railroad involved in two fiery oil train derailments in North Dakota during the past two years has been hired as the first track inspector for a new state-run rail safety program. Karl Carson will go to work for the state Public Service Commission on Aug. 17, doing inspections to identify problems with track and worker safety. A Minot native, Carson is a division engineer with BNSF Railway. He’s worked for the railroad since 1992, holding several positions including assistant director of maintenance production, in which he supervised maintenance and replacement of track and track components, according to the PSC. He’s worked in management for BNSF since 2004. North Dakota is the 31st state to partner with the Federal Railroad Administration on a state rail safety program. The FRA has primary responsibility for rail safety in every state. The PSC began looking seriously at the need for a state program after the December 2013 derailment of a BNSF oil tanker train near Casselton, which caused a massive fireball and voluntary evacuation of the city. Six cars from a BNSF oil train derailed May 6 near Heimdal in east-central North Dakota. No one was hurt in either incident. Carson’s new position is one of two approved by state lawmakers in April when they voted to spend $523,345 on the state rail safety program in 2015-17, with the intent of continuing the pilot program in 2017-19. State Sen. Tyler Axness, D-Fargo, who first publicly suggested a state-run rail safety program in July 2014 during his unsuccessful campaign for the PSC, said he doesn’t necessarily disagree with Fedorchak that the pool of qualified applicants for the inspector job is probably limited in North Dakota, and he declined to make any judgments about the hire without seeing the pool of applicants. “You’d think something this controversial, even the appearance of impropriety should be avoided whenever possible,” he said. Don Morrison, executive director of the Dakota Resource Council, drew a comparison to the hiring of Lynn Helms, a former employee of Texaco and what is now Hess Corp. who now regulates and promotes the state’s oil and gas industry as director of the state Department of Mineral Resources. Fedorchak said the PSC had 18 applicants for the job and interviewed the top five, with second interviews for the two finalists. She noted Carson was the “strong favorite” among the FRA inspectors on the interview panel. Carson earned a certificate of completion in auto mechanics from Bismarck State College in 1990 and also served in the North Dakota Army National Guard from 1990 to 1994. He couldn’t immediately be reached for comment. His annual salary with the PSC will be $90,000. By Dan Gunderson, Mar 29, 2015 at 6:37 p.m.
MOORHEAD, Minn. — North Dakota environmentalists want oil companies to reduce volatile gasses in Bakken crude. Regulators, however, say they’re taking a different tack that’s cheaper for the industry and still improves safety. The industry disputes that Bakken crude is more volatile, but says most North Dakota crude meets the new standard already. “I think a lot of people have wondered, well, is this going to cure the problem. And our answer is that by itself, it is not the cure,” said Lynn Helms, director of North Dakota’s Department of Mineral Resources. The new, lower vapor standard is a step in the right direction but safer rail cars are also a critical part of the solution, Helms added. The federal government is considering new rules for safer tank cars that might include thicker steel shells and larger pressure relief valves. “If you combine our lower vapor pressure standard with the these high capacity relief valves we should be able to get away from these boiling liquid explosive vapor incidents which create the large explosions if and when we have a derailment,” Helms added. Larger relief valves could allow rapidly expanding gases to escape, preventing rail tank cars from exploding. But critics point out those volatile gases could still catch fire. A newer tank car with improved safety features, the CPC 1232, has been involved in at least two recent oil train derailment and explosion incidents. Environmentalists argue North Dakota could make the oil much safer. “The bottom line profitability of the oil industry is trumping all the rest of us, our safety,” said Don Morrison with the North Dakota environmental group Dakota Resource Council. The North Dakota Petroleum Council, which represents the oil industry, did not respond to an interview request. In December 2013, the potential for disaster became very real after train cars of Bakken oil derailed, caught fire and exploded outside Casselton, N.D., near the Minnesota state line. Derailments and fires involving Bakken crude since then have heightened the worry. Fred Millar, a Washington-based lobbyist and consultant on hazardous materials transportation, contends the new North Dakota standards would not have changed the outcome of a deadly 2013 oil train explosion in Lac Megantic, Quebec in Canada. Train cars of Bakken crude involved in the Lac Megantic explosion and fire had a vapor pressure of about 9 psi, according to Canadian investigators. A search of public records and news reports identified 14 derailments involving crude oil trains in the past two years in North America. Fire was involved in nine of the accidents. New regulations are unlikely to stop crude oil train accidents, Millar said. 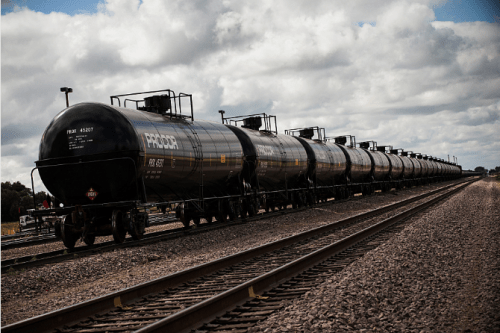 North Dakota plans unprecedented steps to ensure crude pumped from the state’s Bakken Shale oil producing region is safe enough to be loaded into railroad tank cars and sent across the country. In the first major move by regulators to address the role of gaseous, volatile crude in railroad accidents, the North Dakota Industrial Commission, which regulates energy production in the state, said it would require Bakken Shale well operators to strip gases from crudes that show high vapor pressures. “We believe the vast majority of our Bakken oil will fall well below the standard,” Lynn Helms, director of the state’s Department of Mineral Resources, said at a news conference. The proposed state rule will require all operators to run crude oil through equipment that heats up the crude and forces out gases from the liquid. An estimated 15% of current producers without such equipment will have to submit quarterly test results showing their wells don’t exceed the state’s proposed 13.7 pounds a square inch vapor pressure limit, Mr. Helms said. A representative for the North Dakota Petroleum Council, an industry lobbying group, criticized the proposed rules for “micromanaging the industry,” and said they could lead to unintended consequences such as increased burning of excess natural gas at well sites. The proposal also would prohibit blending condensate or natural gas liquids back into crude and require rail loading terminals to inform state regulators of any oil received for shipment exceeding the vapor pressure limits, Mr. Helms said. He said the new rules would cost industry, but not enough to make drilling Bakken oil uncompetitive. The state’s decision follows months of officials’ playing down the possibility that Bakken crude was more volatile and could explode more readily than other North American crudes. Several oil trains have derailed and exploded since 2013, spurring concern about the safety of growing numbers of oil-carrying trains delivering oil produced by the shale boom. The Wall Street Journal reported in February that Bakken crude contained several times the amount of combustible gases as oil from elsewhere. Relying on an analysis of data collected at a pipeline in Louisiana, the Journal pointed out that oil from the Bakken Shale had a far higher vapor pressure, making it much more likely to emit combustible gases, than dozens of other crude oils. The proposed rules specify how wells should treat the oil to ensure it is “in a stable state,” according to Mr. Helms. Executives from the top oil companies working in the Bakken Shale told state regulators in a September hearing that their crude is safe to transport by train using existing treatment methods, opposing potentially costly requirements that they make the oil less volatile before shipping it. But studies by the U.S. and Canada have indicated that Bakken crude is more volatile than other grades of oil. Industry-funded studies, including one commissioned by the NDPC, have said Bakken oil is no different than other types of light oil. The state expects to issue final rules by December 11th. Production of light shale oil through hydraulic fracturing has soared, accounting for most of the additional three million barrels a day of oil that the U.S. produces today compared with 2009. Much of that is shipped to refineries by railcars, especially crude produced from Bakken Shale due to the area’s few pipelines. Bakken crudeDakota Resource CouncilLynn HelmsMassive increase in crude-by-railNorth Dakota Department of Mineral ResourcesNorth Dakota Industrial CommissionNorth Dakota Petroleum CouncilOil stabilizationScott SkokosState regulationVolatile gasesWhiting Petroleum Corp.